The Indian e-commerce sector seems to have turned into a battleground for two American giants. Over the recent weeks, several news reports have suggested that retail major Walmart and e-commerce behemoth Amazon are in the fray to acquire a majority stake in Bengaluru-based Flipkart. Currently, Japan’s Softbank is the largest investor in the company. 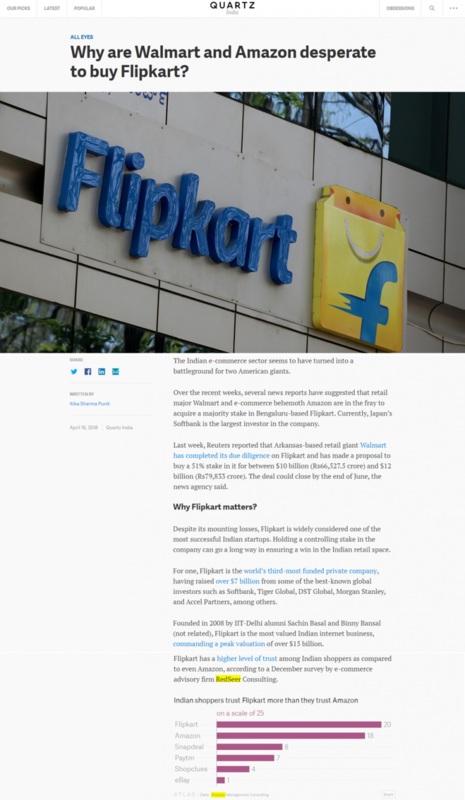 Last week, Reuters reported that Arkansas-based retail giant Walmart has completed its due diligence on Flipkart and has made a proposal to buy a 51% stake in it for between $10 billion (Rs66,527.5 crore) and $12 billion (Rs79,833 crore). The deal could close by the end of June, the news agency said. Despite its mounting losses, Flipkart is widely considered one of the most successful Indian startups. Holding a controlling stake in the company can go a long way in ensuring a win in the Indian retail space. For one, Flipkart is the world’s third-most funded private company, having raised over $7 billion from some of the best-known global investors such as Softbank, Tiger Global, DST Global, Morgan Stanley, and Accel Partners, among others. Founded in 2008 by IIT-Delhi alumni Sachin Basal and Binny Bansal (not related), Flipkart is the most valued Indian internet business, commanding a peak valuation of over $15 billion. Flipkart has a higher level of trust among Indian shoppers as compared to even Amazon, according to a December survey by e-commerce advisory firm RedSeer Consulting.